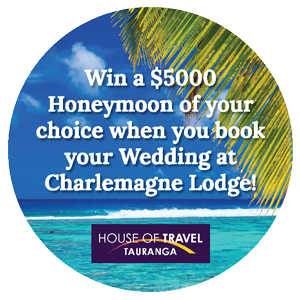 Charlemagne Lodge offers the most romantic setting for your Tauranga wedding, whether you want to get married in our beautiful silk draped indoor marquee or in the garden gazebo. Charlemagne Lodge is the perfect backdrop for your wedding photos indoors or out. There is also an adjoining scenic reserve and the kiwi orchard, offering even more photographic opportunities. The Kaimai ranges in the distance and the rural outlook in the foreground make for a gorgeous panoramic setting. In the evenings enjoy awe-inspiring sunsets over the majestic ranges to the west. The large patio area lends itself to casual BBQ events whilst the function room has plenty of space for a more formal wedding breakfast or dinner with seating for up to 120 guests. Waiting and bar staff are provided, and our fully licensed premises allows us to offer you a full range of bar options. Catering options are also wide to fit any taste, from buffet to full silver service dinners. We can offer assistance in sourcing everything from the Celebrant to the DJ we can even arrange it all for you. Our aim is to offer you flexibility in order to tailor-make your ideal wedding according to your personal taste and budget. We also offer accommodation at Charlemagne Lodge which can be reserved before and after the wedding, allowing the bride to prepare in a relaxed, stress free environment and when your day has ended you can retire to the Lodge. Celebration lunches can be arranged for the day following the Wedding, giving you time to fully enjoy reflections on your special day with family and friends in a relaxed stress free environment. We aim to provide tailor-made and flexible events to suit your personal taste and style. It is our pleasure to discuss any additional requests, ideas and themes that you may have to enhance your special day. Please call our Event Manager to arrange to visit Charlemagne Lodge and discuss your requirements at your convenience, or contact us and request a full Wedding information pack. Exclusive use of the Lodge and Gardens can be secured for weddings for up to 25 people. Please contact our Event Manager for details. Choice of ceremony area (including the silk draped indoor marquee area). Seating for the ceremony for some of your guests. Full use of the gardens and interior of Charlemagne Lodge for your wedding party photos on the day of the wedding. Use of the Function Room and grounds for a rehearsal. All Function Room chairs, tables, crockery, cutlery, white tablecloths, wine glasses, champagne flutes, water jugs and glasses. Sound system for background music with indoor and outdoor speakers, complete with microphone for your ceremony and speeches. The use of the Charlemagne Sword for a ceremonial cutting of the cake. Fairy lights indoors and out, and a spectacular fairy light curtain over the dance floor. Feature lighting in the grounds and gardens. Reverse cycle air conditioning, to ensure a comfortable temperature year round. At Charlemagne Lodge we have the most flexible facilities available for your exclusive use on your wedding day. We only take one booking per day to ensure you have our full and undivided attention. The attractive purpose-built function room can accommodate up to 120 seated guests and is complete with silk roof liners and hundreds of fairy lights. And for later in the evening your guests can enjoy the fairy lit dance floor, where there is plenty of room for a band or DJ. Your party can enjoy the extensive grounds, courtyards, lawns and patios complete with outdoor tables chairs and shade umbrellas; and at night, lighting of garden features. Venue hire charges vary according to season and the day required, please contact us for details of our rates and a full wedding information pack. Special rates are available from time to time, and mid week weddings are often discounted.